Every year around mid-November, shop aisles in Belgium start filling with a special range of beers, the so-called “Christmas beers”, dressed with seasonal labels featuring snowmen, elves or reindeers. To many people, they are merely marketing tools used by brewers to up their sales in winter, at a time when more festive drinks such as mulled wine are favoured. In Northern Europe, and particularly in Norway, the tradition for brewing beer in autumn dates back to the Middle Ages. The first mention of a strong winter beer, called “Juleøl”, can be found in the skaldic poem Hrafnsmál (“raven song” in Old Norse), dated to 900 AD: “At sea the King will drink jol and resume Freya’s game”. The Vikings would drink this beer around December 21st, during the pagan festival of Jul (Yule). Even with the spread of Christianity, the brewing of juleøl persisted. It became a way for Scandinavian people to celebrate and honour their Viking ancestors. In Western Europe, another tradition is thought to have served as an inspiration to Christmas beers. The cultivation of hops (Humulus lupulus) started around 900 AD in Germany, with documents mentioning humularia, or hop fields. By the 13th century, hop growing had become widespread in Europe, and beer was a popular drink. Sadly, storage techniques for beer materials were still rudimentary. Hops and barley would start to deteriorate after a few months, because of humidity and the presence of insects (particularly weevil beetles). This meant grain stocks from the previous harvest had to be disposed of in early autumn. Instead of throwing this precious grain away, brewers started producing one last batch of beer, which became known as “October beer”. Thanks to lower and more uniform temperatures in autumn and winter, this beer benefited from a better maturation process. It was known to store very well, and some brewers even recommended keeping it for two to three years before serving, in order to develop its flavours. 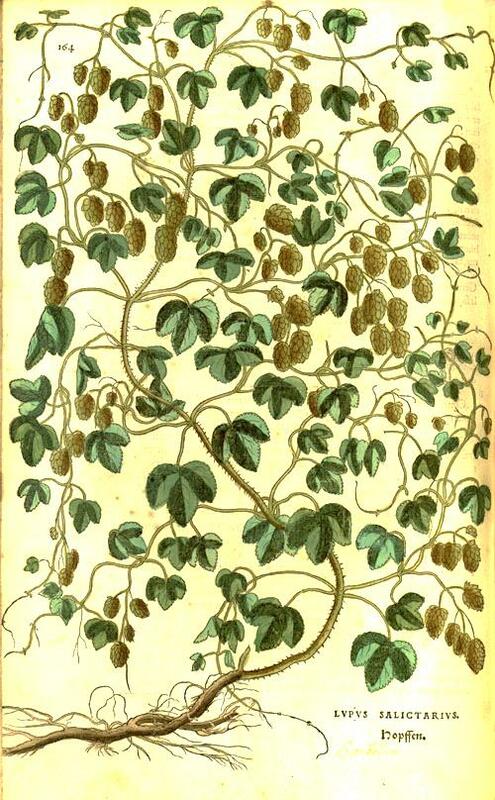 A drawing of hops (Lupus salictarius, now known as Humulus lupulus) in Fuchs “De historia stirpium commentarii insignes”, 1542. The storage of hops was improved in the 18th century, with the development of oast houses, or hop kilns, special barns which were used to dry fresh hops (the moisture content would go down from 80% to 6%). 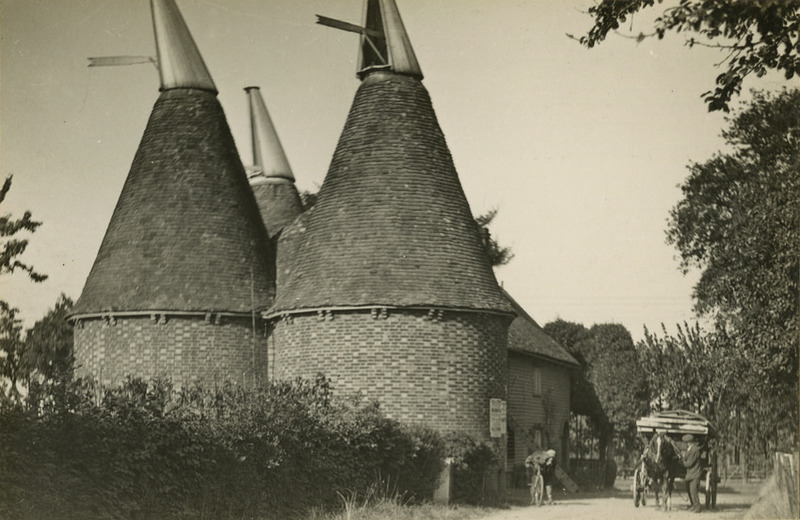 Although no longer used commercially, oast houses are still a familiar sighting in the South-East of the UK, mainly in Kent and Sussex. 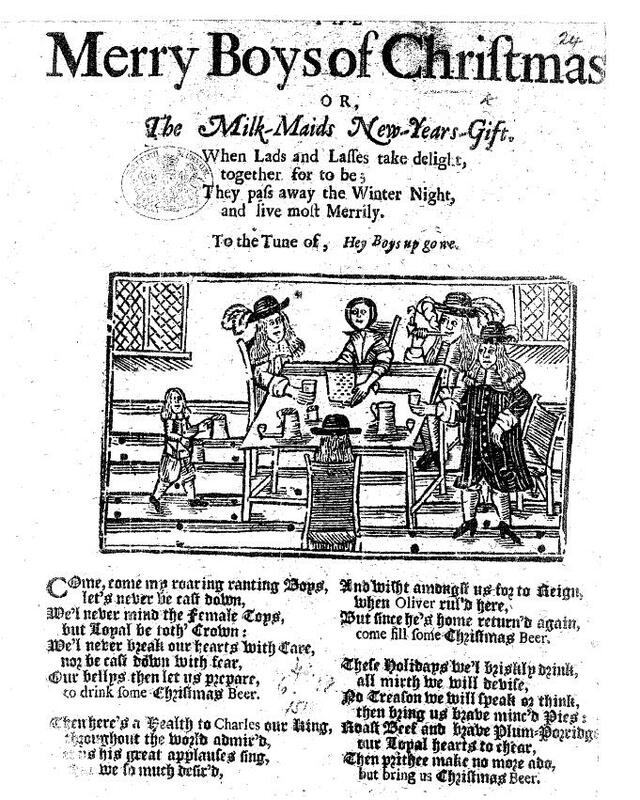 In the UK, Christmas beer is first mentioned in this 1681 song, “The Merry Boys of Christmas”: these Holidays we’l briskly drink, all mirth we will devise, No Treason we will speak or think, then bring us brave mine’d Pies: Roast Beef and brave Plum-Porridge, our Loyal hearts to chear: Then prithee make no more ado, but bring us Christmas Beer”. This was probably October beer, ready to be drunk in December. 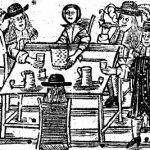 Commercial brewing of “Christmas beer” became more widespread in the 19th century. 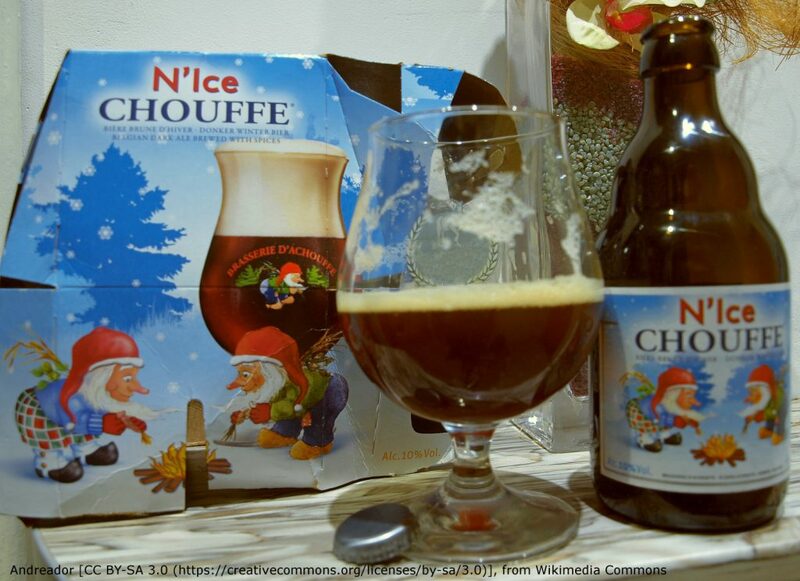 Although most Christmas beers sold nowadays share some characteristics with October beers of the past – dark colour, strong alcohol content, malty and sweet taste -, many of them are brewed with added honey or spices that are reminiscent of seasonal cakes such as clove, cinnamon, cardamom, ginger or orange peel. Some beer specialists believe that spices were added to compensate for the low quality of the grain and hops. By giving the beer “instant” flavours, this may also have allowed brewers to shorten the maturation time. The tradition of Christmas beer has expanded around the world – Germans brewers produce “Weinachtsbier”, French brewers “bière de Noël”, and Christmas ales are now popular in the UK too. On a side note, the Stella (Artois), a beer that is particularly well-known in the UK, was actually created in 1926 as a Christmas beer, taking its name from the Christmas star! Jackson, M., & Jackson, M. (1988). The new world guide to beer. Philadelphia, Pa: Courage Books. Russell, D. (2008). Christmas beer: The cheeriest, tastiest, and most unusual holiday brews. New York: Random House. Smith, G. D. (2014). Beer: A global history. London: Reaktion Books. 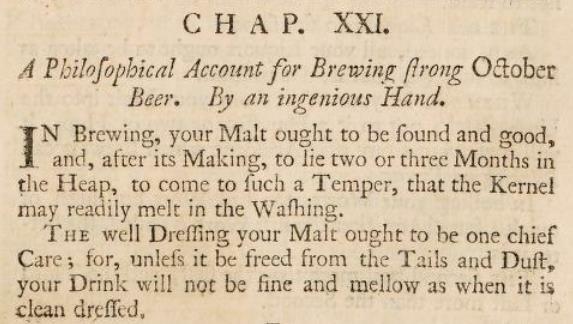 The London and country brewer: Containing the whole art of brewing all sorts of malt-liquors, as practiced both in town and country … also, the method of preserving liquors in the cask … In three parts, to which is added, a supplement. (1759). London: Printed for T. Astley; and sold by R. Baldwin. There is an excellent web site on the production of malt. Well worth reading.